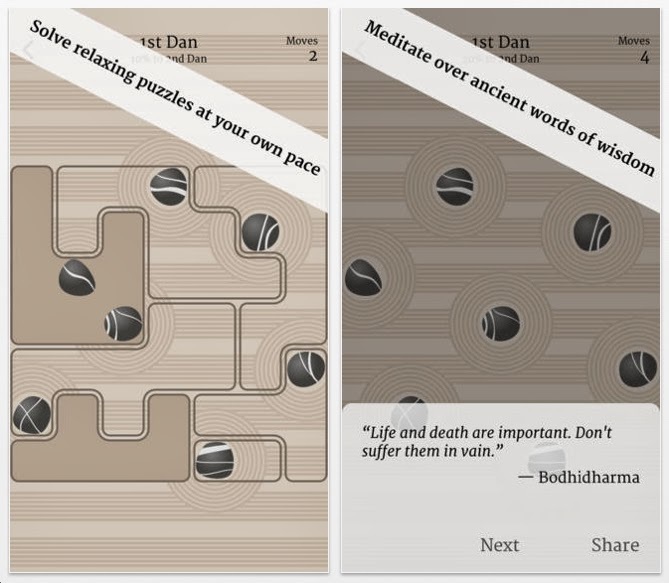 My friend Nicola Salmoria often sends me emails about new puzzle apps that are worthy of this blog. He created Twin Beams about 1.5 years ago. It was an instant classic. I've played it often. For the past 2 months Nicola has been sending me beta versions of his newest: Zen Garden Puzzle. The object is to put a stone in each region, making sure that each column and each row has exactly 1 stone. That's it. I've spent at least 5 hours on the various beta versions. The puzzles are not that hard. However, they make you think because you will want to solve them using as few moves as possible. Lots of puzzles have a certain number of levels. Either I want to do them all, or I simply give up and acknowledge defeat. Zen Garden Puzzle is different. You can solve every level with guess and check. And there seems to be an infinite number of levels. Which makes the experience somewhat meditative. 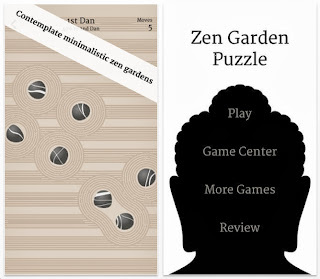 Unquestionably, Zen Garden Puzzle is one of the best puzzle app games of 2013. The final list of Best Puzzle App Games for 2013 will be announced on December 30 & December 31.